One of Coke's plants in India has been shut down since March 2004. The company's overexploitation and pollution of scarce water resources and the high levels of pesticides found in some of its products continue to spark huge protests. "And, as usual, Coke responds with public relations scams, deceptive statements and citations of phony awards. According to Coca-Cola, "For four consecutive years, Coca-Cola plants in India have won the prestigious Golden Peacock Environment Management Award for environmental practices from the Institute of Directors, which grants the award in association with the World Environment Foundation." Oddly enough, Coke doesn't mention the fact that Sanjiv Gupta, president and CEO of Coca-Cola India, sits on the executive council of the Institute and that Coca-Cola contributes heavily to the World Environment Foundation. Coke also boasts: "In late 2005, the Confederation of Indian Industry (CII) recognized the Hindustan Coca-Cola Kaladera plant as a 'Water Efficient Unit' across industries at the National Awards for Excellence in Water Management." But Coke didn't disclose that Tarun Das, director-general of the Confederation of Indian Industry, serves on the International Advisory Council of The Coca-Cola Company. Coke keeps claiming that it was exonerated of human rights abuse allegations by two judicial inquiries in Colombia and two "independent investigations" in the U.S. But no court in Colombia has ever ruled on the human rights claims against Coca-Cola. U.S. State Department human rights reports point out that only a handful of the thousands of murders of Colombian trade unionists in recent years have ever resulted in successful prosecutions. "Cases where the instigators and perpetrators of the murders of trade union leaders are identified are practically nonexistent, as is the handing down of guilty verdicts," said the State Department. So it's not surprising that the plaintiffs cannot secure justice through Colombian courts. That's why they're seeking redress through U.S. courts in the first place. Coke states: "...(A) respected, independent third party found no instances of anti-union violence or intimidation at bottling plants." This refers to a bogus report issued in 2005 by Cal Safety Compliance Corporation, a Los Angeles-based company whose work was commissioned and paid for by The Coca-Cola Company. Cal Safety's monitoring record has been discredited in publications like the Los Angeles Times and Business Week. It is "not regarded as a credible monitoring organization within the mainstream worker rights advocate community as a result of its track record of missing egregious violations in high-profile cases and its flawed monitoring methodology,"according to United Students Against Sweatshops, an international student movement fighting for sweatshop-free labor conditions and workers' rights. USAS cites Cal Safety's poor monitoring track record as measured by Dr. Jill Esbenshade in her book, "Monitoring Sweatshops." Esbenshade conducted extensive interviews with Cal Safety auditors and directly observed the company's labor auditing in practice. She didn't find Cal Safety's poor track record surprising because she said they failed to adhere to minimum accepted standards for competent factory investigations. Prior to the Cal Safety report, Coca-Cola repeatedly claimed that another group had investigated allegations of human rights abuses by Coke's bottlers in Colombia and exonerated both Coca-Cola and its bottlers. When students at Carleton College in Minnesota asked for a copy, they were told by a Coca-Cola representative that the report was done by White & Case, but was unavailable to the public. It so happens that White & Case is a large international corporate law firm that has represented Coca-Cola in lawsuits dealing with human rights abuses at its Colombian bottling plants. Alexis Rovzar, an executive partner at White & Case, serves as a director of Coca-Cola FEMSA, Colombia's largest Coca-Cola bottler and a defendant in the lawsuits. As recently as January 30-31, 2007, at two Canadian college campuses, Coca-Cola continued spreading misleading information about its activities in India and Colombia. Coke boasted that The Energy and Resource Institute (TERI), described as "an Indian-based nonprofit research organization," had "begun an assessment of our company's water resource management practices in India" and would be 'working with an independent steering committee that will oversee the study..."
Months earlier, in April 2006, Coca-Cola's North American President Donald Knauss sent a letter to the University of Michigan's Chief Financial Officer, Tim Slottow, that said in part: "We are in active dialogue with TERI, a highly respected Dehli-based NGO with deep experience on sustainability issues to develop a transparent and impartial independent third party assessment of water resource management practices at Coca-Cola facilities in India..." Mr. Slottow immediately responded for the university: "...[We] are supportive of your work with The Energy and Resource Institute ( TERI ), a highly respected nonprofit organization with more than 30 years of experience and leadership on sustainability issues, to develop a transparent and independent third party assessment of water resource management practices at Coca-Cola bottling plants in India..."
It's simply amazing that any campus administrator, let alone the University of Michigan's CFO, could be duped into believing that TERI is impartial or independent. After all, Coca-Cola India Ltd. is listed by TERI on its website as a corporate sponsor and TERI Governing Council member Deepak S. Parekh is on the Advisory Board of Coca-Cola India. At least two current projects of TERI are sponsored by Coca-Cola India Ltd. The Centre for Science and Environment (CSE) issued a report of test results regarding unacceptable levels of pesticides in Coca-Cola and Pepsi Cola soft drinks being sold throughout India. The India Resource Center , reported that the study found high levels of lindane, a confirmed carcinogen, sometimes as high as 140 times those allowed by EU and BIS standards; chlorpyrifos, a neurotoxin, sometimes as high as 200 times those allowed by EU and BIS standards; heptachlor, which is banned in India and not used in the US since 1988, was found in 71% of samples, at levels 4 times higher than the proposed BIS standards; and malathion, a pesticide that was found in 38.6% of the samples tested. The U.S. Environmental Protection Agency recommends that workers wait at least 12 hours before entering an area where malathion has been applied. "This is a grave public health scandal," said Sunita Narain, CSE's director and winner of the prestigious 2005 Stockholm Water Prize. Coca-Cola tries to undercut the credibility of CSE's test results by raising questions about the accreditation of the CSE lab and the equipment and methodology it used. In the same breath, Coca-Cola says, "The methods used to test our finished products have been developed by the company and Control Science Laboratory (CSL), which is an independent laboratory used by the U.K. government. Although the validation of the methods has not been completed, they represent the state of the art in terms of procedure and technology. CSL runs an international program to test the proficiency of laboratories in analysis, including pesticides." On January 5, 2007, The Coca-Cola Co. issued a "report" to Coca-Cola North America college and University Stakeholders focusing on issues in Colombia and India. In the report, Coke says: "Tests by the Central Science Laboratory (CSL) on soft drinks made by the Coca-Cola Co. in India detected no residues of the four pesticides allegedly found in the products by the Centre for Science and Environment (CSE). CSL's tests reported less than 0.1 parts per billion of each of these four pesticides." But on August 14, 2006, BBC News had pointed out a significant flaw in CSL's tests. It reported that "the tests were done by the UK-based Centre Science Laboratory (CSL), which is known for its expertise in testing for pesticide residue in food. The Centre for Science and Environment (CSE), which claims to have discovered the pesticide contamination in the first place, says the [CSL] scientists only tested Coca-Cola samples provided by the company itself. "Frank Lavin, U.S. Undersecretary for International Trade, warned that bans imposed on soft drinks like Coca-Cola and Pepsi could blight India's hopes of attracting American investment and result in a setback for the country's economy." Might this have been a warning to British and Indian political leaders that they had better play ball with the Coca-Colas of the world? Both The Coca-Cola Co. and the University of Michigan are trying to use the United Nations' International Labor Organization (ILO) Evaluation Mission report to whitewash the allegations of widespread labor and human rights abuses in Coke bottling plants in Colombia. Although the report is actually damaging to Coke, it in no way touches upon or was meant to be an investigation of human rights abuse allegations involving Coca-Cola bottlers in Colombia as was claimed by the company since Spring 2006. Coca-Cola Chairman and CEO E. Neville Isdell stated at Coca-Cola's annual shareholders' meeting in April 2006: "...we have a document from the ILO, signed by the ILO, committing themselves to do exactly what you said...We have a document. We have an agreement, and they are going to investigate past and prior practices..."
The ILO report and the statements below prove that The Coca-Cola Company has been lying to the public, the media and their shareholders. In an April 10, 2006 letter to the University of Michigan, Coke claimed: "On March 2nd, the International Union of Food, Agricultural, Hotel, Restaurant, Catering, Tobacco and Allied Workers' Associations (IUF) announced that it had requested the International Labor Organization (ILO) to investigate and evaluate past and present labor relations and workers' rights practices of the Coca-Cola bottling operations in Colombia...Our company supports the IUF in this effort and, in fact, sent our own request for an investigation to the ILO. On March 24, the ILO agreed to conduct the investigation and evaluation..."
1. The IUF never asked for such an investigation. The IUF's Ron Oswald: "Well, he [Coca-Cola Chairman and CEO E. Neville Isdell] was wrong, and they know he was wrong...Our proposal to the ILO was very clear: we did not ask them to do an investigation into criminal or murderous events in the 1990s...I don't think they've got the competence to do that, frankly... There are still calls for Coke to agree to an independent investigation of those incidents and that's something we thought Coke should have agreed to many years ago." 2. The Company never supported such an investigation. Coca-Cola's Dana Bolden wrote: "The agreed-upon scope of the assessment [in Colombia] was always of current workplace practices." 3. The ILO never agreed to conduct such an investigation. The ILO's Sally Paxton said: The ILO would at most be carrying out an "assessment of current working conditions at enterprises in Colombia" and not an "investigation" of The Coca-Cola Co. or past labor practices or human rights abuses of its bottlers. With the release of this report, Coca-Cola and University of Michigan's integrity are the big losers! For 2 1/2 years, The Coca-Cola Company has fended off criticism of its crimes in Colombia by circulating a big lie: that the United Nations' International Labor Organization (ILO) was conducting an investigation and evaluation of past and present labor relations and workers' rights practices of Coke bottlers in that country. In this document, we will explain events that led up to the ILO's October 2008 report and place them in the context of Coke's deceptive public relations policies. In the Spring of 2005 a Commission was created to establish a protocol for a truly independent investigation into charges that Coca-Cola bottlers in Colombia were involved in the systematic intimidation, kidnapping, torture and murder of union leaders organizing for better working conditions. These charges are the basis for two separate and pending lawsuits, originally filed in 2001 and 2006, which are presently working their way through the United States federal court system. Once the Commission began its work, The Coca-Cola Co., through its Director of Global Labor Relations Ed Potter, did everything it could to undermine its independence and to quash consideration of issues raised in the lawsuits. Thank you for the opportunity to comment on the draft protocol...the suggested revisions are based on our understanding of the purpose and scope of the Commission, which work is based on my proposal to administrators and students on May 6, 2005 to create a working group through my office to consider the possibility of conducting an independent third party assessment of current conditions at Coca-Cola bottling facilities in the Republic of Colombia...We have substituted the word 'assessment' throughout the document for the word 'investigation' as a more neutral dispassionate word...the assessment team should include an ILO official from the ILO standards department...We have added a new 2.5 Non-Admissibility and Non-Discoverability of Assessment Report and Related Items. First, the parties in the litigation in U.S. court must agree in writing that no aspect of the assessment is discoverable or admissible or used in any way in the litigation. Over the next three months, Coca-Cola apparently realized that it would be very difficult, if not impossible, to control the scope of the Commission and that students and other critics would stick to their demand for a truly independent investigation into human rights abuse allegations and the past and present labor policies and practices that allowed the murders to happen and the abuses to continue. At the end of December, both the University of Michigan and New York University responded to concerns raised by students and faculty about Coke's attempts to subvert a meaningful investigation by announcing the removal of Coke beverages from their campuses. On March 2nd, the International Union of Food, Agricultural, Hotel, Restaurant, Catering, Tobacco and Allied Workers' Associations (IUF) announced that it had requested the International Labor Organization (ILO) to investigate and evaluate past and present labor relations and workers' rights practices of the Coca-Cola bottling operations in Colombia...Our company supports the IUF in this effort and, in fact, sent our own request for an investigation to the ILO. On March 24, the ILO agreed to conduct the investigation and evaluation ...Questions concerning the ILO investigation and evaluation should be directed to Ms. Sally Paxton, Executive Director, Social Dialogue (telephone: 011-41-22-799-6332)...If you would like additional information about any of these activities, please contact Ed Potter at (404) 676-2379. It should be noted that Knauss's letter nowhere mentions Ed Potter's role as chief spokesperson for the business sector of the ILO. After learning of Knauss's letter, Campaign to Stop Killer Coke Director Ray Rogers called Sally Paxton at the ILO office in Geneva, Switzerland, to ask about the scope and nature of the ILO investigation. She told him that the ILO would at most be carrying out an "assessment of current working conditions at enterprises in Colombia" and not an "investigation" of The Coca-Cola Co. or past labor practices or human rights abuses of its bottlers. Rogers recalls that she was quite emphatic about this. Thus the ILO was already contradicting Ed Potter's and the Company's previous assertions. Coca-Cola never responded to requests for a copy of the document Isdell cited because no such document or agreement exists. Isdell's words were a complete fabrication, designed to buy time and deceive the media and the public. Three other high-level officials of the ILO have also contradicted Coca-Cola officials and spokespersons. The long awaited report, "Report Evaluation Mission Coca-Cola Bottling Plants in Colombia 30 June - 11 July 2008," <http://www.ilo.org/public/english/dialogue/sector/papers/food/mission.pdf> released in October, does indeed examine only current practices while ignoring past and prior ones. Unfortunately, no one at the ILO has ever been willing to publicly criticize Coca-Cola for misrepresenting the ILO's agreed-upon role. Nonetheless, the report has been hailed by University of Michigan administrator Greg Tewksbury as a positive reflection upon The Coca-Cola Company, even though Coca-Cola brazenly broke its word to the university. He also ignored criticism of Coke's current labor relations policies and practices in Colombia that are contained in the report. Like the ILO, Ron Oswald and the IUF never challenged Coke's lies or its 2 1/2-year public relations scam. 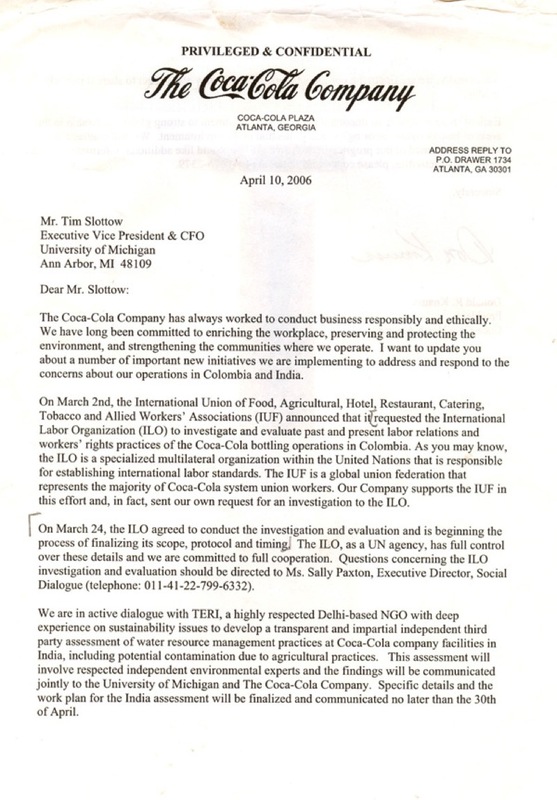 In September 2008, Montana filmmaker Matt Beard received a letter from Dana Bolden of The Coca-Cola Co. stating that "the agreed-upon scope of the assessment [in Colombia] was always of current workplace practices." This was the first time that a Coke representative admitted that the company knew the ILO had never agreed to the type of investigation that students and administrators demanded at Commission meetings three years earlier. Bolden's admission is extremely significant because it was this false claim that the ILO would investigate past and present labor relations and workers' rights practices that prompted University of Michigan administrator Tim Slottow to unilaterally bring Coke products back on campus and led to similarbut unsuccessful - efforts by administrators at New York University. Consider what happened at a June 2007 ILO meeting in Geneva. The Sydney(Australia) Morning Herald (6/6/07) reported: "Employers led by a Coca-Cola executive [Ed Potter] stopped the International Labour Organisation examining violations of workplace rights in Colombia..." At this meeting, Potter's job was to shield Colombia and Coca-Cola from any real scrutiny at a time when the Colombian government's and multinational corporations' ties to paramilitary death squads that prey on workers and their unions were receiving more attention than ever before in the international media. "The assessment was a thorough, independent evaluation," Greg Tewksbury, interim associate vice president for finance and University treasurer, says of the report released Oct. 13. "Among the conclusions was recognition of The Coca-Cola Company's efforts to prohibit child labor, ensure equality and non-discrimination, and provide health and safety programs...Additionally, the University is pleased that Coca-Cola and its bottling plants will address the ILO report recommendations as they continue to examine labor practices in their Colombia bottling plants." The Mission interviewed the company representatives to ascertain whether they exercised any control of suppliers of raw materials (such as sugar) to ensure that they did not use child labor. The manager at the Coke plant in Cali said thattheir suppliers should not use child labor, but added "that the enterprise [Coca-Cola] did not yet exercise oversight over this issue." Tewksbury failed to mention that 20 Michigan campus groups had formed a coalition to demand that the University's Dispute Review Board remove Coke products from the campus; he writes that only one organization, Students Organizing for Labor and Economic Equality, lodged a formal complaint against Coca-Cola. And it took a single letter based on a lie from Donald Knauss to convince one UMich administrator to reverse a democratically arrived-at decision. Coke's Director of Global Relations Ed Potter has held the powerful role of U.S. employer representative to the ILO for over 15 years, and has been instrumental in requesting ILO involvement. A letter that NYU sent to Coke a few months prior to the 2005 resolution sheds some light on the meaning of 'independent.' 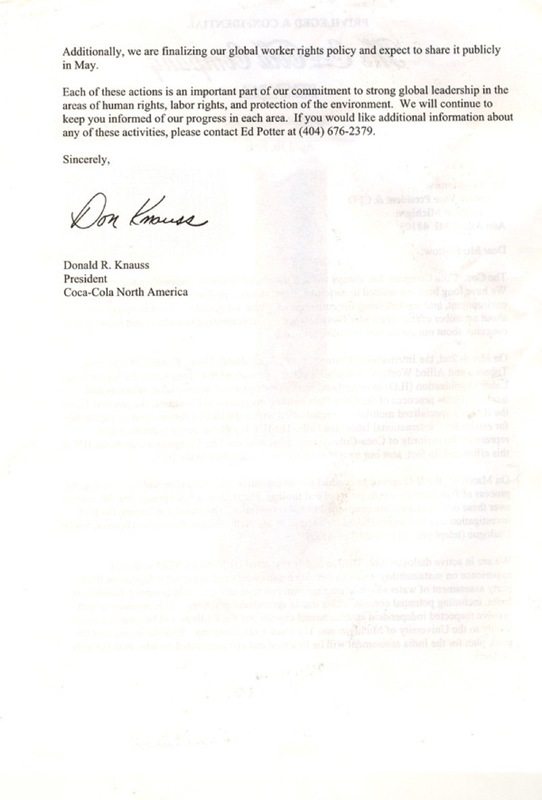 The letter specifically demanded that The Coca-Cola Company submit to an investigation into its relevant operations in Colombia by the Workers Rights Consortium, a non-profit organization created by students, labor rights experts, and workers from across the globe with participation from college and university administrators. Coke refused, citing an investigation that it claimed was independent but that the Senate decided was not credible. The University Senate then responded by voting to institute the current ban. The ILO report contradicts Coca-Cola when it describes the scope of what the ILO had agreed to: "The Coca-Cola management and the International Union of Food, Agricultural, Hotel, Restaurant, Catering, Tobacco and Allied Workers' Associations (IUF) jointly requested the International Labour Office (ILO), in 2006, to carry out an evaluation Mission of conditions of work and labour relations in certain Coca-Cola bottling plants in Colombia." ...the Mission found that there appears to be a link between outsourcing and the fall in union membership and/or the fact that these workers do not organize. One union representative (SINTRAINDEGA), from the Bogota South plant, said that "with the company's hiring system, the union is destined to disappear... In the space of one year we have lost 100 members." [Another union,] USITRAG, said: "The main problem is that very few have a direct relationship with the enterprise. This is due to the way in which the enterprise hires workers who provide certain services; the problem is the high incidence of subcontracting. Because of this workers are unable to organize and the future of the union is in danger." The SINALTRAINAL representatives in the same plant agreed, observing that "Union membership has been decimated as a result of various ploys used by the enterprise such as the reinforcement of the accord [collective accords are agreements between employers and non-union workers]. All the unions are dwindling because the enterprise is standing in their way..."
The ILO has completed its independent evaluation of Coca-Cola bottling operations in Colombia. The report states everything suggests that conditions of work applicable to direct employees are duly respected, to the extent that they are regulated by legal instruments, collective agreements or accords. The report found that Coca-Cola bottlers are upholding labor standards that have been ratified in Colombia, including confirming that workers enjoy freedom of association, a work atmosphere free of anti-union intimidation and a safe working environment. Direct employees, it should be understood, represent a very small percentage of Coke's workforce in Colombia. Coke has lied and misled the public about the percentage of Coke workers in its Colombian bottling plants who are represented by unions. Since August 2005 the company has claimed that: "...more than 30 percent of Coca-Cola System workers in Colombia are unionized, in a country where the average for all companies is about four percent...and [The Coca-Cola System] employs approximately 8,000 people." However, Coca-Cola doesn't consider the vast majority of Coke workers in Colombia to be employees, but rather "flexible," subcontracted workers who cannot get union representation, receive low pay and meager benefits (if any) and have no job security or future with the company. In fact only a tiny percentage of Coke's workers in Colombia belong to unions. In 2007, two groups of subcontract workers attempted to join SINALTRAINAL, but the bottlers responded with mass firings. In his booklet, "The Anti-Coke Manifesto," Andy Higginbottom, an instructor at England's Kingston University, estimates that "by the beginning of 2005, less than a thousand workers had stable employment contracts. The workforce employed in the 'Coca-Cola system' in Colombia is still nearly ten thousand workers, but 90% of these are now 'flexible' workers ..."
For Coca-Cola, outsourcing is obviously a way to bust unions and create "union-free environments." The first is the existence of a system of dependent company-sponsored labour relations through company-established worker structures [accords] competing with union representation, often with the explicit support of plant management. This system of parallel structures - similar to the destructive "Soldarismo" system in some Central American countries - aims to deny company employees fair and full access to union rights. The second is the extensive use of outsourcing and other forms of precarious employment prevalent throughout Colombia and increasingly in the globalized economy. The report shows how by outsourcing many activities which are core to the operations of the bottlers, the companies systematically deny and restrict the ability of those workers to exercise their rights to join a union of their choice." The Campaign to Stop Killer Coke has always challenged Coke's official line that there was going to be an "independent investigation." Until Dana Bolden's recent belated confession that "the agreed-upon scope of the assessment [in Colombia] was always of current workplace practices," the company always lied about it. Although this report is an indictment of Coca-Cola's current labor practices, the world is still waiting for an independent investigation of past and present human rights and labor abuses against unionists involving Coke bottlers and management in Colombia. Aaron Bernstein, a veteran writer on labor affairs for BusinessWeek who is currently a Wertheim Fellow at Harvard Law School, published a paper in September 2008 called "Incorporating Labor and Human Rights Risk Into Investment Decisions." Bernstein also notes that "allegations that a supplier bottler in Colombia conspired with paramilitary groups to intimidate union activists there and was complicit in the deaths of eight union leaders...led to widespread student boycotts in the United States..."
Coca-Cola's failure to address the events in Colombia that led to the pending lawsuits, campus bans, boycotts and public outrage is still a festering scandal. The same should be said about the lies Coke has foisted upon a world all too willing to believe them. The Coca-Cola Company has always worked to conduct business responsibly and ethically. We have long been committed to enriching the workplace, preserving and protecting the environment, and strengthening the communities where we operate. I want to update you about a number of important new initiatives we are implementing to address and respond to the concerns about our operations in Colombia and India. On March 2nd, the International Union of Food, Agricultural, Hotel, Restaurant, Catering, Tobacco and Allied Workers' Associations (IUF) announced that it requested the International Labor Organization (ILO) to investigate and evaluate past and present labor relations and workers' rights practices of the Coca-Cola bottling operations in Colombia. As you may know, the ILO is a specialized multilateral organization within the United Nations that is responsible for establishing international labor standards. The IUF is a global union federation that represents the majority of Coca-Cola system union workers. Our Company supports the IUF in this effort and, in fact, sent our own request for an investigation to the ILO. On March 24, the ILO agreed to conduct the investigation and evaluation and is beginning the process of finalizing its scope, protocol and timing The ILO, as a UN agency, has full control over these details and we are committed to full cooperation. Questions concerning the ILO investigation and evaluation should be directed to Ms. Sally Paxton, Executive Director, Social Dialogue (telephone: 011-41-22-799-6332). We are in active dialogue with TERI, a highly respected Delhi-based NGO with deep experience on sustainability issues to develop a transparent and impartial independent third party assessment of water resource management practices at Coca-Cola company facilities in India, including potential contamination due to agricultural practices. This assessment will involve respected independent environmental experts and the findings will be communicated jointly to the University of Michigan and The Coca-Cola Company. Specific details and the work plan for the India assessment will be finalized and communicated no later than the 30th of April. Additionally, we are finalizing our global worker rights policy and expect to share it publicly in May. Each of these actions is an important part of our commitment to strong global leadership in the areas of human rights, labor rights, and protection of the environment. We will continue to keep you informed of our progress in each area. If you would like additional information about any of these activities, please contact Ed Potter at (404) 676-2379. "...The International Labor Organisation is a UN body that exists to promote labour and human rights. It is made up of representatives from government, employers and trade unions. After coming under pressure from the University of Michigan student body...Coca-Cola agreed to approach the ILO with the International Union of Foodworkers to ask that they conduct an assessment of workplace practices in Coke's bottling plants in Colombia. The ILO announced their intention to do so on 24 March 2006. 'I absolutely disagree' says Ed Potter emphatically. This is an unfortunate thing to say, as inside the annual meeting, just metres away from where we are standing, staff are issuing a printed company statement on Colombia, in which The Coca-Cola Company describes the ILO assessment as an 'investigation' on three occasions in five lines of text. This, they claim is 'fulfilling our commitment to an independent, impartial third-party investigation and evaluation,' though it fails to mention Ed Potter is the US Employer Delegate on the ILO. The body that just happens to be conducting this particular 'independent and impartial' assessment. In case there is any lingering doubt Ron Oswald says 'there are still calls for Coke to agree to an independent investigation of those incidents and that's something we thought Coke should have agreed to many years ago.' So obviously the ILO assessment is not that 'independent investigation'. There was never going to be an investigation into past practices of Coke bottling plants in Colombia by the ILO. So I asked Coca-Cola if they would publish or let me see the document Neville Isdell alleges the ILO had given the Company, to see how such a prominent captain of industry could be so confused. After all it is probably not a good idea to tell untruths and give false information to shareholders at an annual meeting...They ignored my question. Matt Beard: "The Cost of a Coke"
Andy Higginbottom, "The Anti-Coke Manifesto"